Accessories - fittings for photography, marine compasses, kayak carts, water pumps, safety equipment, PFD, etc - all items designed or specifically selected for use with folding kayaks and canoes. 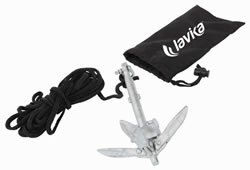 Folding / locking 4 fluke heavily galvanized anchor, 6m of line, and durable nylon storage bag. The top fluke end of the anchor has the standard safety feature - an eye to attach the main line in case the anchor gets snagged. Sold as a plain board and supplied with a pair of J-clamps and Star nuts. Custom versions available on order. 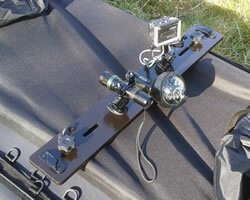 Example shown has clam cleats, eyelets, GoPro mounts (one is holding a torch), Garmin Silva 70UN marine compass. A board that will help you sharpen your balance skills and improve your core strength. Unlike the kayak, the balance board doesn't help you regain balance when it wobbles, making it ideal for paddlers looking to improve stability and engage more muscles during exercise. As a bonus, it works wonders for lower back pain. An hard wearing robust PVC buoyancy bag that fits most folding kayaks right in the very ends of the bow and stern. Longer conical bags of 20l is available on request. 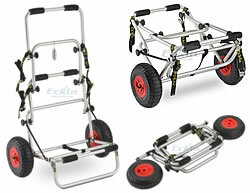 This cart was specially designed for folding kayaks - simply the best cart available. There are many kinds of kayak carts but none come anywhere as practical as this one piece FOLDY. - flat-packed - to put away inside or on stow top of the rear deck of the assembled kayak. 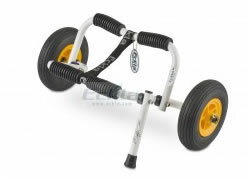 With large sized quick release pneumatic wheels and sturdy anodized aluminum frame, this cart will go over most types of terrain - soft sand to pebble beaches. Key cross bars have pairs of rubber tubular padding. Complete with a pair of kayak securing straps and a drawstring bag. The FOLDY, with the wheels removed, is compact enough to fit through the cross-rib behind the rear seat of most folding kayaks and even through the cross-rib at the front of the smallest single seater kayak. Alternatively kayaks with deck lines / perimeter D-rings, the cart, can be strapped on top of the rear deck using the cart's own securing straps. A very practical and well made cart. Minimalist cart originally designed for glass fibre sea and plastic touring kayaks. 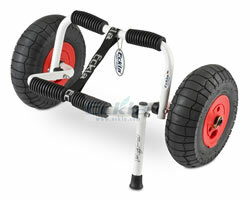 Shaped to fit through small hatches when folded and with the quick release wheels removed. Includes a single leg kick-stand. The main difference to the Eckla 'Canyon' is that the wheel axle bar does not go right across the frame to the other axle. White coated. Minimalist cart originally designed for glass fibre sea and plastic touring kayaks. With larger wheels than the Atlantic 200 making it suitable for heavier loads and rougher ground. Shaped to fit through small hatches when folded and with the quick release wheels removed. Includes a single leg kick-stand. The main difference to the Eckla 'Canyon' is that the wheel axle bar does not go right across the frame to the other axle. White coated. Basic kayak cart. 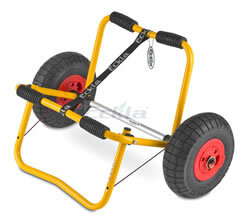 The large quick release pneumatic tyres allows for easy transport of bigger kayaks / canoes when ashore. With a wide kickstand to keep the boat off the ground. Folds flat to stow under deck. Made of a solid high quality anodized aluminum alloy - will not rust. The Sea Rover features a large compass with easy-to-read markings—no squinting to read where you’re going! With a simple yet elegant base, the Sea Rover attaches easily to deck lines or sits nicely on top of a deck bag. Quick-release buckles allow for easy attachment. Built for tough marine use, this directional compass features two sets of easy-to-read markings for visibility from both top and sides of compass. Multi-purpose steering / sighting marine SILVA 70UN / 70UNE compasses. These compasses come included with a base holder that you can screw onto an aluminum or wooden 'bridge'. The compass holder allows for easy removal of the compass itself for quick hand bearings or for packing the compass away when not in use. When mounted in the compass holder, the compass serves as a steering compass. These compasses float! Ideal for kayaks with large open type cockpits. The white Silva 70UNE has an built in diode illumination powered by two watch batteries. 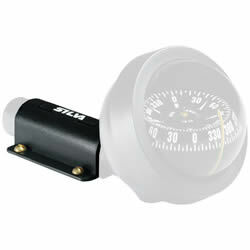 The universal compass that can be used in its bracket as a steering compass or as a bearing compass when handheld. The design allows for many mounting alternatives. It can be installed in any inclination or position with a bracket that allows for fast and easy removals. It is also easy to remove for security purposes. 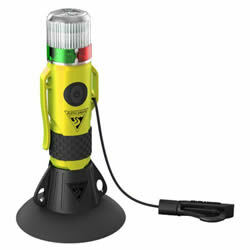 Suitable for kayaks, dinghies, canoes, small boats and more. These compasses have bungys and hooks - place directly onto the foredeck and clipped onto existing deck lines. Ideal for kayaks with keyhole cockpits. 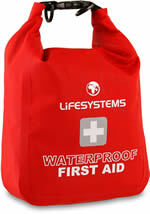 Can also be used on large open type kayaks with spray covers fitted with perimeter D-rings. Dual purpose cradles that can be used for car-topping and to keep your kayak / canoe off the ground. Due to the firm open cell foam construction, the cradles will hold your kayak without any pressure points. The top part of the cradles are curved to fit most common kayak hull shapes. The cradles have a groove on the underside and this groove will fit over the majority of car roof racks and canoe trailer bars, and the cradles can be easily removed when not in use - groove is 6cm wide at its widest point. The cradles can also be placed directly on the ground - to protect the hull from sharp stones, messy grass, etc. NB - bag is not waterproofed. 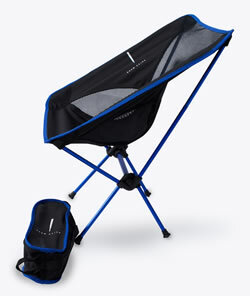 Camp chair - not strictly an kayak item but is an very useful accessory for those long overnight trips or midday break. 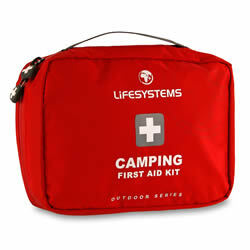 Packs small into a bag that can be easily carried inside the kayak / canoe. This rescue Knife has a rounded tip to avoid puncturing equipment or cutting yourself. Serrated blade, ideal for cutting rope. non-locking blade, 7cm blade with rounded blunt tip. 12cm when closed. Yellow only. NB - this bladed product is not for sale to people under the age of 18. Serrated blade, ideal for cutting rope. 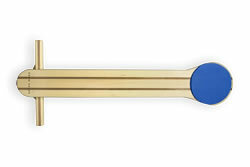 Locking blade, 6.4cm blade with rounded blunt tip. 11.4cm when closed. Red only. Plain foam mats cut to shape to fit on the floor between the cross ribs and the bottom pair of pole stringers. Height (thickness) of the mats can be selected to be level with the cross ribs - to create a safe flat level floor for dogs or to sleep on. 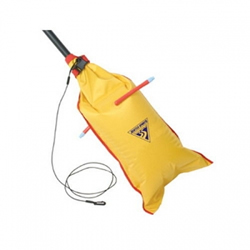 Made of closed cell high density foam - waterproof, buoyant, and provides insulation. The mats are simply cut to the required trapezium shape, shaped to fit exactly between the ribs and the hull sides - available in various colours. No provision is made for any fittings on the floor - you can easily cut out the required grooves / indentations using a sharp knife. 'Custom' cut on special request. 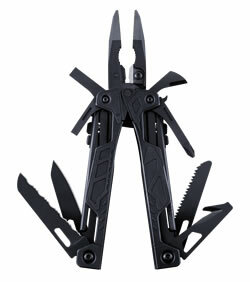 Leatherman OHT with Molle Sheath - in various colours. 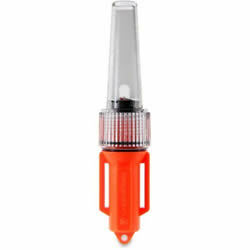 These LifeSystems Light Sticks are primarily designed as emergency signaling devices. Each Light Stick lasts for up to 15 hours. 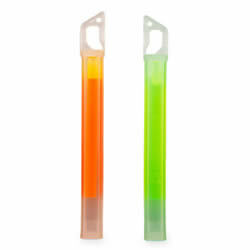 They come in both green and orange colours. To activate just bend, snap and shake thoroughly. Full glow will just take a few seconds. Designed to be held in a removable base sucker (included) for hard shell kayaks as well as fabric decked kayaks via cords through base eyelets. The strobe has lanyard clips so can be attached to PFD's plus has a magnetic base. There is also an integrated safety whistle. This paddle float is designed with an extra large air capacity for maximum buoyancy, quick-release buckles for easy attachment to kayak paddle blades and a clip-on safety tether to eliminate loss in windy conditions. Very simple to use. Stored 'flat packed' and ideally tethered to the kayak's rear deck. 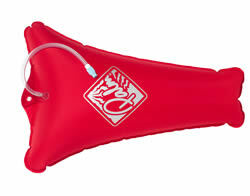 To use, insert the paddle blade into the deflated bag and inflate both chambers via the twist valves, and secure the float by fastening the strap around the neck of the paddle blade. The paddle float tether should be kept attached to the kayak at all times. This bright yellow float can also double up as a flag to attract attention (on end of paddle) and also as a buoyancy bag (without paddle inserted). 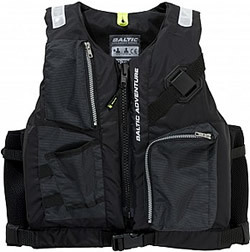 As the name suggests, the Adventure is the ideal buoyancy aid for adventure on the water. 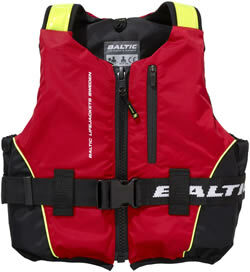 If you are fishing, paddling or just looking for a vest with multiple pockets, the Adventure is an excellent choice. There are two front zip pockets, a large one to use for example, a bait box and a smaller one for a mobile phone. The Adventure also has several attachment points, a holder for pliers or multi-tool and retro reflective patches on the shoulders. The back has also two drain mesh pockets. As these are 50N buoyancy aids, these products are only suitable for competent swimmers. 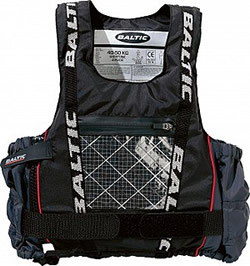 BALTIC Dinghy Pro - side zip PFD An advanced dinghy and kayak buoyancy aid used by Olympians and world champions. Airex super soft foam in combination with laminated polyethylene foam makes it extremely comfortable to wear. Featuring a Mylar front pocket and a durable all Delrin zip. Waistband with double Velcro closure to prevent riding up, reinforced shoulders and bottom draw tie. High cut for easy hiking and trapezing. As these are 50N buoyancy aids, these products are only suitable for competent swimmers. K2 is a highly versatile buoyancy aid for the kayak or dinghy that fits just as well in regular recreational craft. The K2 has padded shoulders with retro-reflectors, zipped pocket and an attachment facility for a crotch strap (part 2510). K2 has easy side adjustment for a good fit to sit securely and comfortably in active water sports. As these are 50N buoyancy aids, these products are only suitable for competent swimmers. Aqua-Bound Master bilge pump. A high capacity pump that pumps out 1 gallon (3.78 litres) per 8 pump strokes. The hose fitting is designed to accommodate hoses with an internal diameter of 1 inch (no hose is supplied, water will eject at a distance). The pump can be opened up for cleaning (remove debris, etc) and is fitted with a high visibility floatable high density foam sleeve. The pump is strong, with a stainless steel piston rod. There is an moulded eyelet - to attach a safety tether (not supplied) to the deck of the kayak. 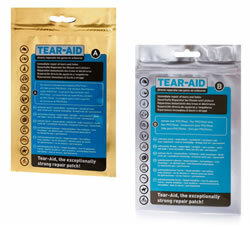 Tear-Aid, the indispensable repair patch for outdoor and indoor usage. Tear-Aid is a unique transparent repair patch suitable for repairing tears and holes in practically many types of materials and is extremely strong and very elastic. Tear-Aid is no temporary solution, it is a permanent repair patch which will also serve as a "Master" repair kit for your outdoor and indoor equipment, and can withstand temperatures between -28 and +60 degrees celsius. 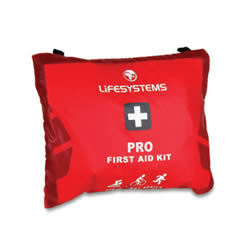 Tear-Aid repairs, not only the kayak's skin and accessories, other outdoor items such as canvas / nylon tents, sleeping bags, camp beds, groundsheets, tarpaulins, backpacks, dry suits, wetsuits, jackets / cags, to name a few. Tear-Aid is available as Type A and Type B. Both types have the same unique qualities but each type is designed for a specific group of materials. Tear-Aid can be used to repair tears and holes in the centre of the material, as well as tears and holes on the edge of the material. 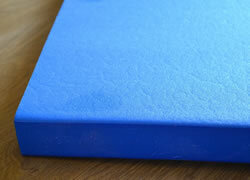 For tear and holes on the edge of the material, a nylon line (supplied) is used to reinforce the edge of the repair. Type A - Most materials other than vinyl and PVC. Suitable for hypalon, TPU, CSM, canvas decks, nylon sponson sleeves, cordura bags, spray covers / skirts, and sail sheets. 90% immediate adhesive strength, 100% adhesive strength after 1 hour. Type B - Only for vinyl and PVC. Can be used immediately, 100% adhesive strength after 24 hours. Each sealed sachet comes with a 7.6cm x 30cm patch, 4 alcohol pads, nylon line and instruction leaflet. You cut the patch to the preferred size (scissors not included). For optimal attachment, the patch needs at least 2,5 cm of coverage around the tear. For larger tears, longer/wider rolls are available on request. 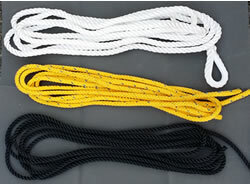 Black 5m with plain ends, Yellow 4m with plain ends, White 4m with nylon eye. Rope with an eye carabineer available on request.